Religious Zionism rabbis invited to emergency conference tomorrow in Jerusalem, in light of Jewish Home refusal to negotiate. 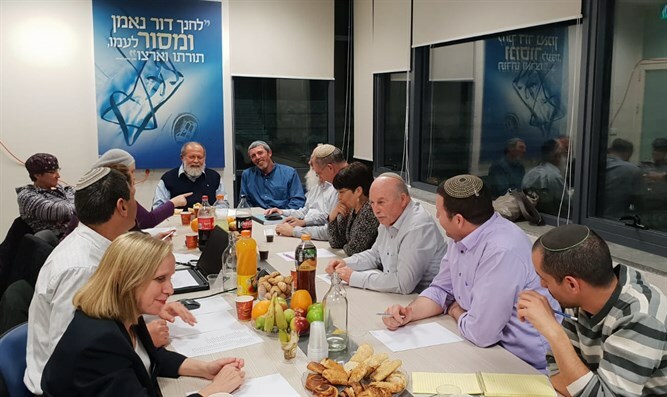 Rabbis representing religious Zionism were invited to an emergency conference to be held tomorrow at 16:00 at the Ramada Hotel in Jerusalem, in light of the lack of progress in negotiations between the Jewish Home and National Union parties. The rabbis will call on party leaders to enter one room and not to leave "until white smoke emerges", in the words of the organizers. The emergency conference will be held on the backdrop of Jewish Home Chairman Rabbi Rafi Peretz's decision to refuse an equal run with the National Union. National Union Chairman MK Betzalel Smotrich suggested Peretz head the united list and allow the National Union to choose the senior portfolio entering a future coalition. Rabbi Peretz agreed to the proposal last Friday, but decided on Saturday night to renege. In Jewish Home they're considering the possibility of receiving seats on the Likud list for the Knesset or running on an independent list, a move which, according to all polls, is likely to fail in view of Jewish Home's dismal situation in the surveys. "On Thursday and Friday, I held a long personal dialogue with Jewish Home Chairman-elect Rabbi Rafi Peretz, with the aim of reaching an agreement and signing a joint run by the two parties in the upcoming elections on the basis of equality and joint leadership," Smotrich said Saturday night. "And indeed, without intermediaries and advisors - and after significant concessions on my part to quickly close the joint run, we were able to reach full understandings before the start of the Sabbath. In this framework it was agreed that Rabbi Peretz would be placed first on the list and the National Union would be given the right to choose the first government position. They call it equality. "Unfortunately, at the end of the Sabbath, Rabbi Peretz informed me that after consultations he held with his associates, he decided to withdraw from the agreement to an equal base and joint leadership - and return to the opening position that the Jewish Home is the senior partner and we are the house guests. Therefore, negotiations at this stage have reached a dead end." Smotrich stressed that "out of responsibility, I intend to continue to do everything to reach a broad list of all elements of religious Zionism and the right wing even if it seems that at this time the possibility of joining the Likud as a surplus is seen as more appealing to Jewish Home members."